Our grounds are the perfect backdrop for weddings, family reunions, BBQ’s, anniversary parties, camping excursions and every kind of special event in between. From nature enthusiasts looking to explore our wooded campsites, to private weekend soirees, we can accommodate all group sizes and budgets. 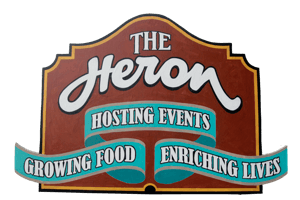 Dream up your perfect event and come celebrate at The Heron! You can’t have a campout or party without good food. Our on-site farm store is the perfect place to stock up on organic vegetables, shiitake mushrooms, chicken, pork, grass-fed beef, maple syrup, honey and so much more. Each group’s vision for a celebration is unique and we’d be glad to discuss your event and budget with you. Send us your ideas for the perfect weekend in the country! Website delivered by Brooks New Media.